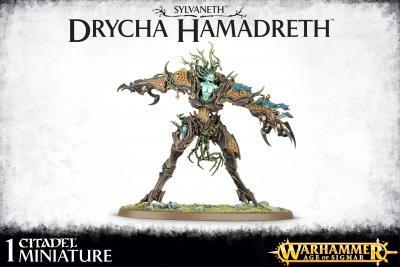 Said to be a truly ancient spirit, one who fought at the end of the world-that-was, the daughter of Alarielle known as Drycha Hamadreth has named herself the Regent of the Outcasts, leading them into battle while screaming her discordant songs of hatred for all who are not sylvaneth. Her lack of control and bloody-minded genocidal urges make her a frightening foe – wavering between crushing depression and white-hot rage, she makes no distinction between orruk and Stormcast, gor-kin and duardin. She is an agent of violence who will fight on and on until her twisted dream of sylvaneth dominion is achieved.